Today, Chicago based tech startup Ovie is launching a series of products on Kickstarter: https://kck.st/2JJR9Br to help people stop wasting food and money by keeping track of their food, so they can eat it before it spoils. Essentially, the entire Ovie Smarterware system turns an ordinary fridge into a smart fridge, but without the smart fridge price tag! 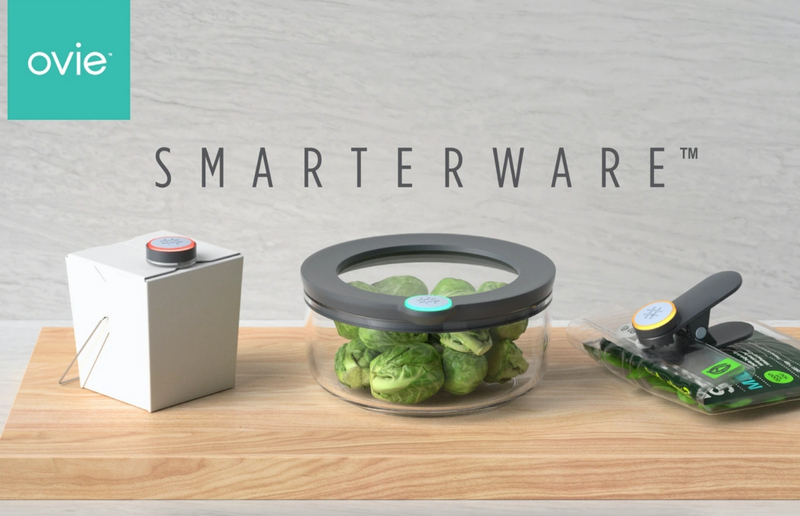 The Smarterware product line consists of Smart Tags, 6-cup containers, clips, and universal connectors that can attach to any container or bottle in a fridge. The Smart Tags fit securely into the Smarterware container, clip, and universal connector. Each tag features a light ring to give instant at-a-glance visual cues showing the freshness of every tagged item in the fridge. For instance, the light starts off on green meaning it’s safe to eat, then turns yellow to show it should be eaten soon, and then ultimately to red when it’s time to throw it out. Ovie goes a step further and integrates with Alexa and other smart home hubs, recipe apps, and grocery apps. It will keep track of everything tagged and will send reminders to a smartphone when food is about to go bad. It will also provide tips on how to eat it, recipe ideas using other tagged items in the fridge, and even connect with grocery apps to allow users to order missing ingredients to complete a recipe. Scott Wilson, owner of MNML Design Studio in Chicago and creator of 8 successful Kickstarter projects, rounds out the founding Ovie team. There are seven Kickstarter: https://kck.st/2JJR9Br pledge levels ranging from the very limited “Super Early Bird” price of $35 (includes 3 Smart Tags and 3 Universal Connectors) to a “Tag Everything Kit” at $300 (includes 15 Smart Tags, 9 bowls, 9 Universal Connectors, and 6 clips). Ovie plans to begin shipping Smarterware in early 2019. Retail sets will start at $59.99 and will be available at www.ovie.life. For more information, email Jessica@maxborgesagency.com or follow us at @FridgeSmarter.